Supergirl is a character in Superman. 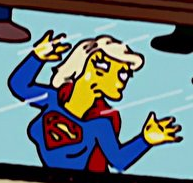 Supergirl was featured in the comic book Supergirl vs. the Glass Ceiling. When Comic Book Guy noticed a new comic store had opened up across the street he said at it can't be true as it would be like Superman moving to Gotham City. Martin Prince, Jr. pointed out that he did it in World's Finest Comics #94 and pointed to the comic. Comic Book Guy told him that was an imaginary story, dreamed by Jimmy Olsen after he was kicked in the head by Supergirl's horse, Comet and it never really happened. Modified on February 27, 2018, at 14:15.